Once again we are faced with a hurricane hitting the United States. The live blog will cover all aspects of the storm including track and impacts. Get Information here for latest tracks and intensity. 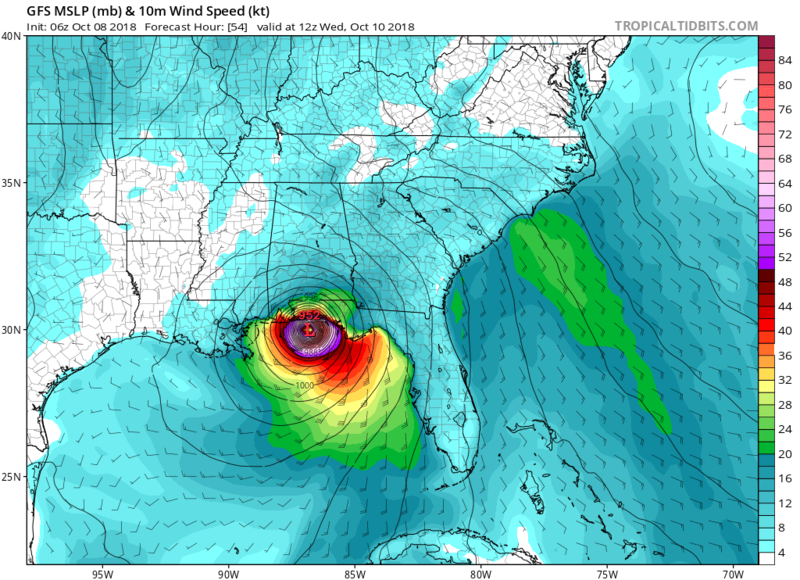 Wednesday October 10th, 2018 1:00 pm EDT – Michael made landfall and should have been a Cat 5 given the pressure and winds. Panama City will be in the eye wall for a long time this afternoon which means considerable damage. Still finding winds over 150 kts on radar. 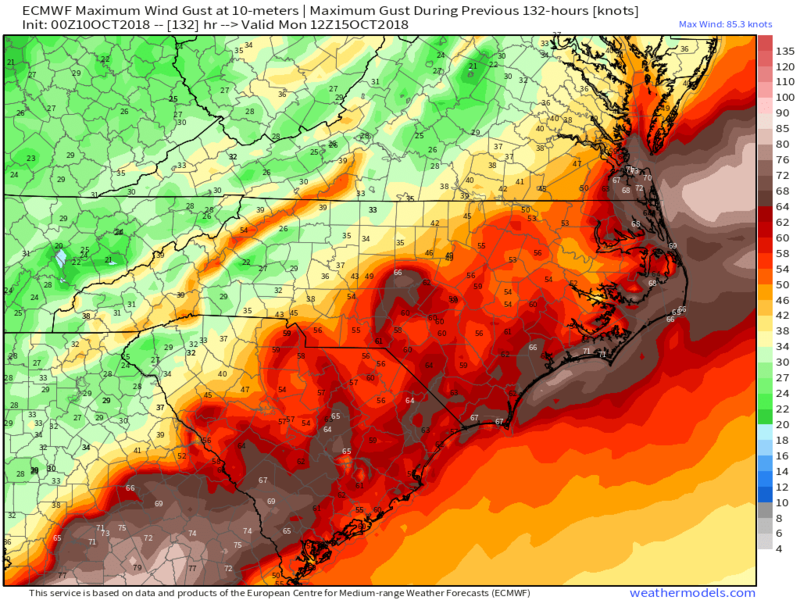 Now our attention turns to the wind damage that will occur across southern Georgia and all the way along the path of Michael to Virginia Beach. Below is a map of wind gusts through tonight. Wednesday October 10th, 2018 10:00 am EDT – Winds continue to increase based on radar with an amazing reading of 172 mph based on radar. Recon is in the storm now and waiting to see what they find. It will be very close to Cat 5 if not a Cat 5 storm at landfall. This now deadly due to storm surge well above 12 feet and damaging winds well inland. Wind damage will be all along the track of Michael. 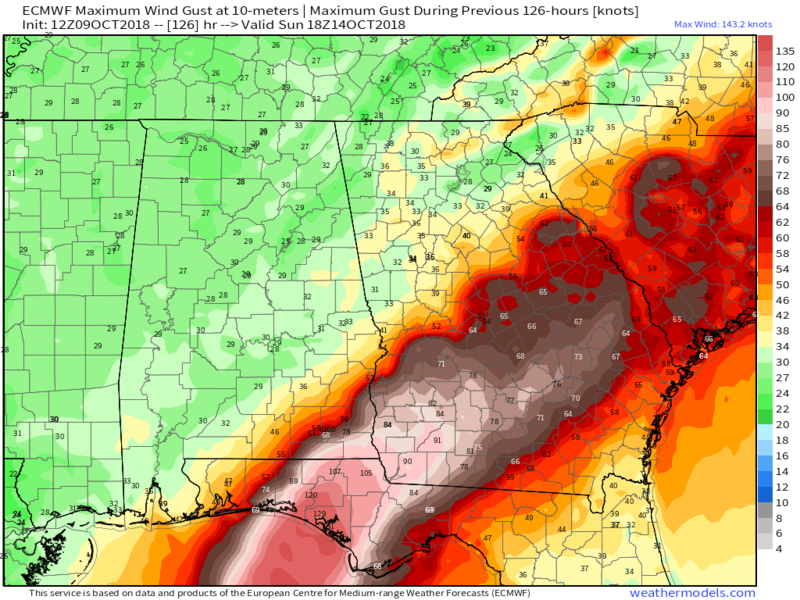 Wednesday October 10th, 2018 6:00 am EDT – Michael is a very dangerous Cat 4 storm. As I said this week, this is a developing storm coming in like a buzz saw. I expect total destruction where the eye goes with wind damage all along the path of Michael to Virginia Beach. Below are the wind gust maps showing the peak winds along the track of Michael. 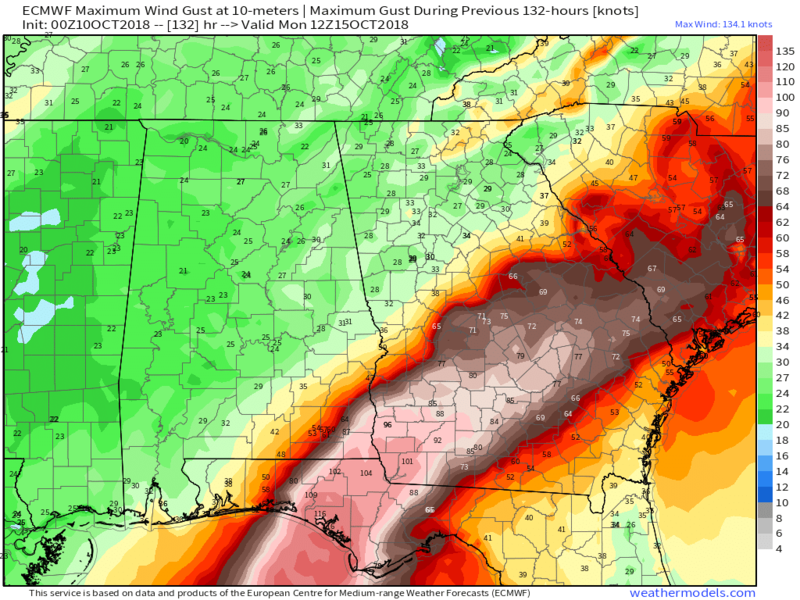 Even southern Georgia will see massive wind damage with most trees damaged or blown down. Landfall will be around 1pm edt near Panama Beach. I don’t expect much will be left in that area as the storm surge comes in and takes a lot out. Tuesday October 9th, 2018 6:00 pm EDT – Michael has become a Cat 3 hurricane. I have been trying to get the point across that wind damage will occur all along the track of Michael as the system weakens but remains very strong all the way to the mid-Atlantic coast. 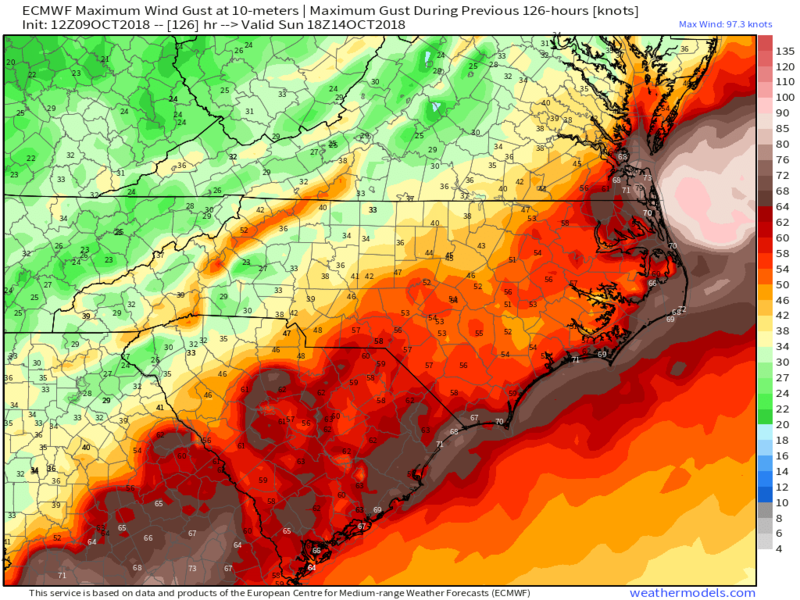 The following maps produced by Dr. Ryan Maue, probably one of the most brilliant data scientist out there, shows the peak wind path of Michael with gust to hurricane force even along the coastal areas of the Carolina’s through The Delmarva. There is no doubt that winds over 100 mph will occur well after landfall into Georgia and I expect the wind damage in the Florida Panhandle to be worse then Florence if you can believe that. Tuesday October 9th, 2018 7:00 am EDT – Michael has stopped for the moment in regards to intensity but not movement. It appears that a little shear and dry air got into the system overnight, but that will end and Michael should continue to strengthen the rest of the day. At landfall, I would say a strong Cat 2 or Low Cat 3, but in any case, a devastating storm in regards to wind and storm surge. As mentioned yesterday, this is a moving and developing storm which are the most dangerous types in my opinion. Wind gusts near Panama City which is where landfall appears to be now, will be well over 100 mph. 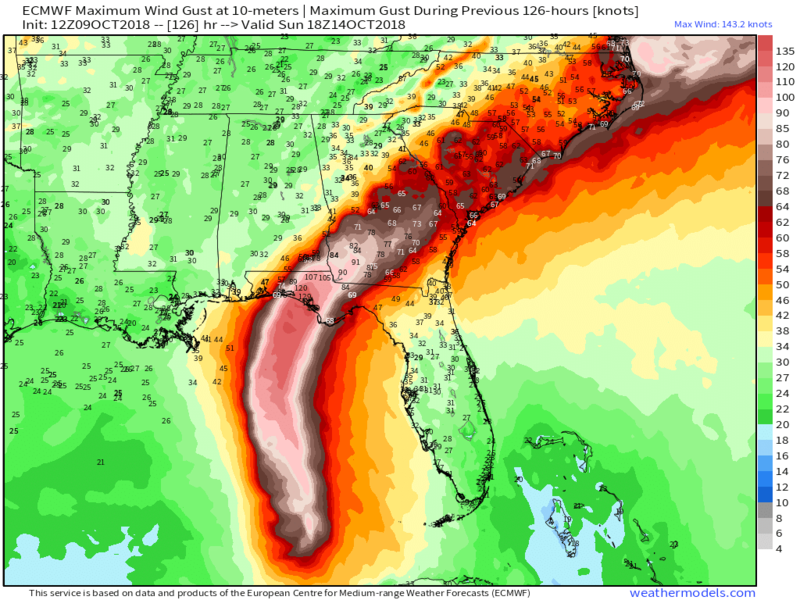 Damaging wind gusts will continue with Michael across Georgia and South Carolina. We are not going to see the 2-3 foot rainfall amounts because Michael will be moving quickly. 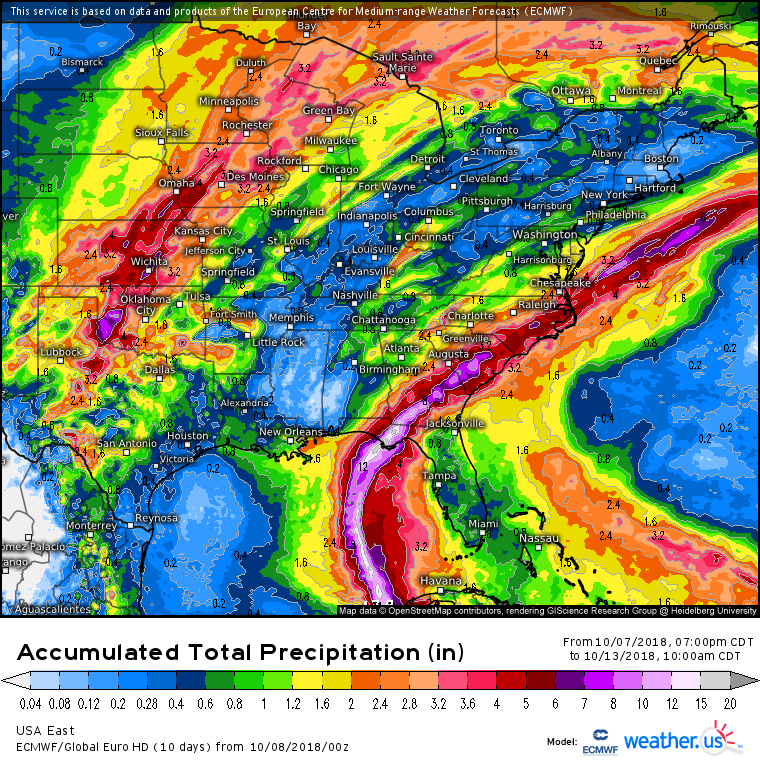 Probably a foot of rain in Florida and southern Georgia and 1-6 inches in a swath across the Carolina’s and southeast Virginia. The coasts of Maryland, Virginia and Delaware will see tropical storm force winds as Michael redevelops off the Mid-Atlantic coast. Monday October 8th, 2018 5:00 pm EDT – The operational models have converged to agree on a landfall near Mexico Beach Wednesday. Track is almost the same all the way to southeast Virginia. 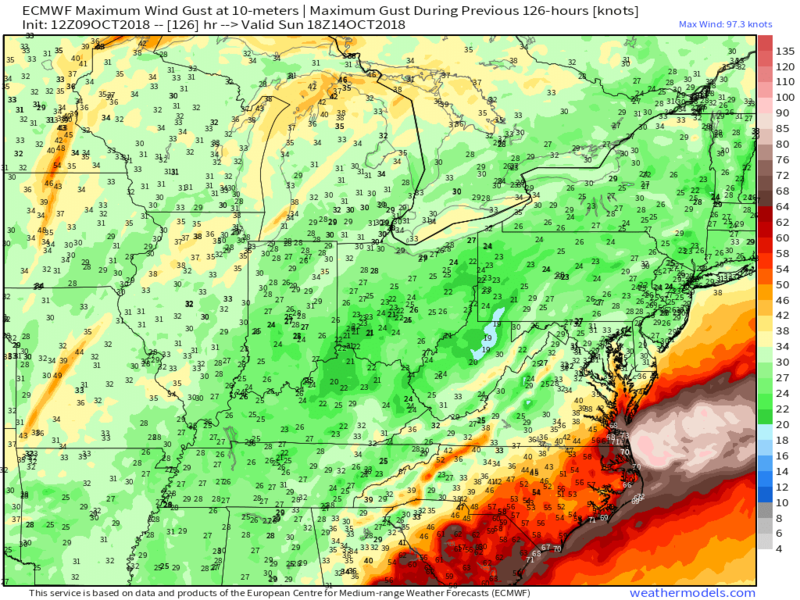 ECMWF wind gust map is below showing devastating winds well inland. Monday October 8th, 2018 11:00 Am EDT – We have a hurricane which was expected this morning. As you can see on the track data, Michael will come in with winds of 120 mph which is Cat 3. That means devastation in terms of wind and storm surge. Path has not really changes with a landfall near Mexico Beach, Fl. Monday October 8th, 2018 9:00 Am EDT – Michael should become a hurricane by this afternoon. 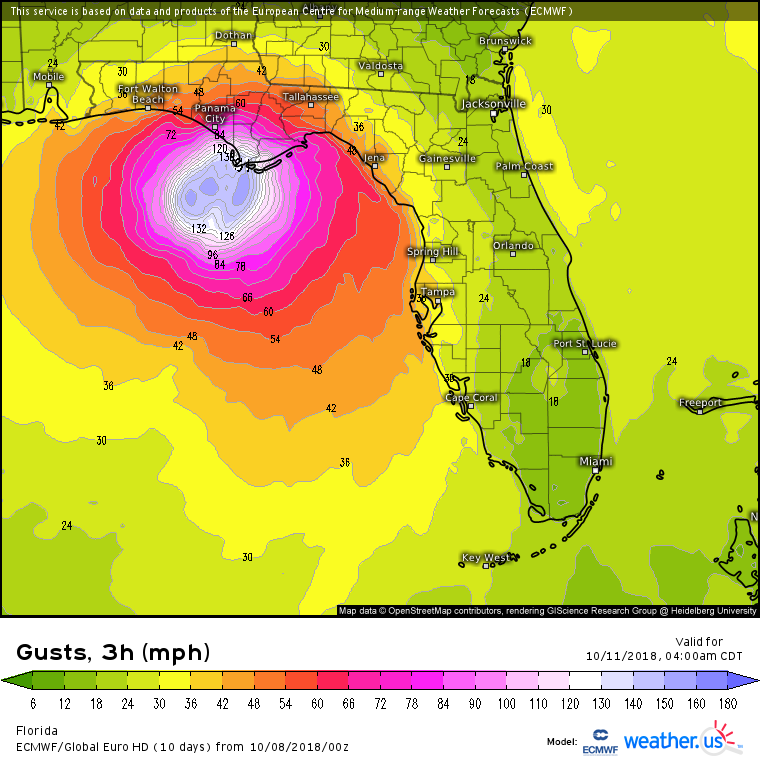 The intensity forecast is now for a Cat 2 at landfall with the ECMWF model showing wind gusts well over 140 mph. GFS has landfall at Fort Walton beach while ECMWF has landfall at south of Port St. Joe in the Florida Panhandle. NHC is between both models near Mexico Beach. I am leaning toward the NHC point of landfall which agrees with the model consensus. Michael will come in with damaging winds and a massive storm surge. Keep in mind, this is a moving and developing storms, unlike Florence which was a developed storm slowing down. Therefore, the damage potential from wind and storm surge is much greater with Michael. Heavy rain track is critical for many areas, especially the Carolina’s. Again, I am following the NHC track which is a consensus of the operational models. While wind damage will be occur across the South, Flash flooding will occur across the Carolina’s into this Mid-Atlantic as Michael hooks up with the cold front. Below are images showing wind and rainfall from the operational models. Click on the image to see a bigger image. 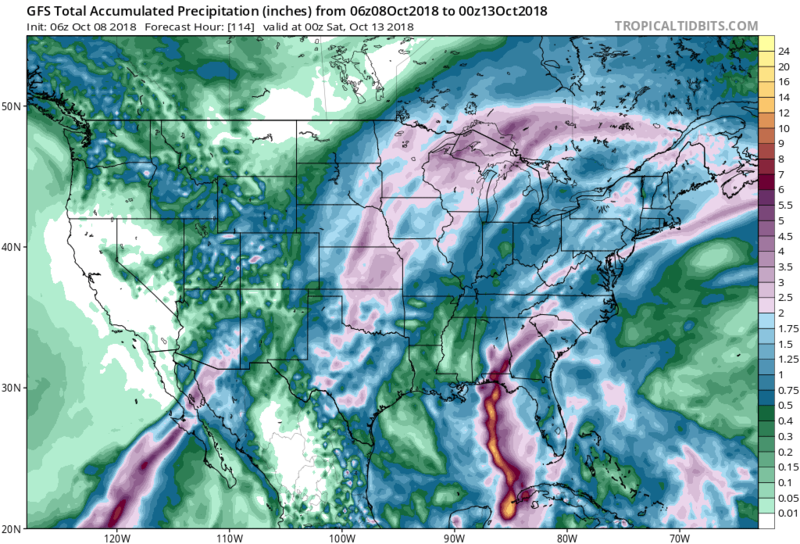 Sunday October 7th, 2018 10:00 Am EDT – Based on the Belize radar, the Tropical Depression looks elongated and maybe fighting a little shear. So it may take all day for the system to become better organized and increase to a tropical storm. In any case, we should see at least a Cat 1 hurricane in the Gulf of Mexico by Tuesday with landfall near Fort Walton Beach, FL. The track of the system will be critical for the Carolina’s given they are still cleaning up from Florence. Heavy rains could bring more flooding problems if the system tracks over the areas hit by Florence. Right now, the GFS goes a little but north of the ECMWF track and it appears NHC as taken a middle ground between the two models.